Paul Dallenbach puts down a record run during qualifying Thursday for the 92nd annual Pikes Peak International Hill Climb. The Basalt driver will race for the 2014 Open Wheel title Sunday. Paul Dallenbach is back at Pikes Peak. The Basalt driver is back in the Open Wheel Class. And he’s is back in the record books. 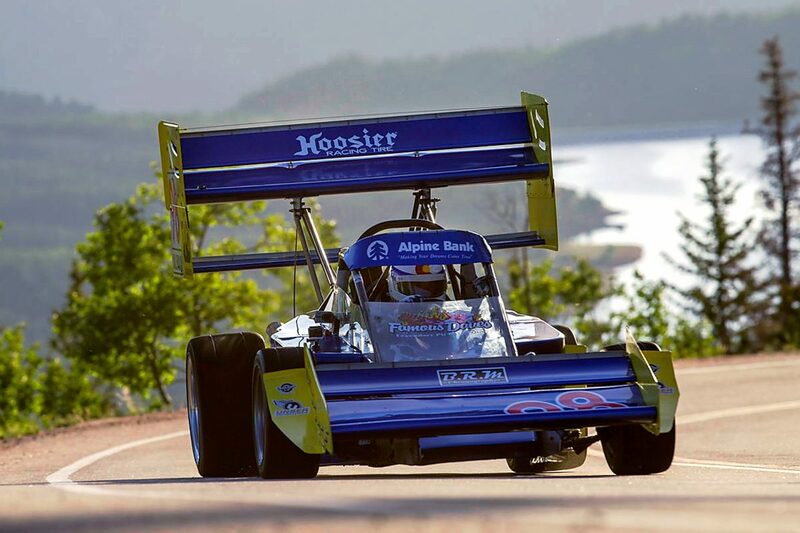 Qualifying opened Thursday for the 92nd annual Pikes Peak International Hill Climb, a race where Dallenbach has taken the racing family to new heights. Race day this year is Sunday. “The car handed great up there and gave me confidence to push harder,” Dallenbach said by phone after his record qualifying run up the mountain. Qualifying runs are staged on the first half of the course, ending just before Glen Cove. The Open Wheel Class is the traditional race car on Pikes Peak, with open wheel cars racing in every hill climb since the first in 1916. Their appearances range from Indy-car style to dune buggies. Dallenbach is returning to the Open Wheel Class this year after setting the world record in the Time Attack division last year. His current car features a small block Chevy engine that generates 750 horsepower. It was built specifically for the Pikes Peak climb. Dallenbach’s crew, Loophole Racing of Colorado Springs, is led by owners David and Bud Hoffpauir. The two lost their homes and shop in the Black Forest fire last year. They are back at Pikes Peak this year with a roster that includes Scott Gross, David LaPerche, Tony Peak, Alan Smith and Steve Woods. Dallenbach and the team participated in the annual Fan Fest on Friday night in downtown Colorado Springs. Their car was on display for the estimated 30,000 race fans at the fest. On actual race day, more than 8,000 fans are expected to line the course to watch the race. The Pikes Peak International Hill Climb is considered the second oldest motorsports race in America, behind only the Indianapolis 500. The annual “Race to the Clouds” follows the famed road to the summit of Pikes Peak — 12.42 miles, 156 turns, starting at 9,390 feet and finishing at 14,110 feet. The vehicles lose as much as 30 percent of their power at the summit because of the elevation. Dallenbach’s appearance this year at the Pikes Peak International Hill Climb is supported by many sponsors. “We are fortunate to have sponsors who are so generous and into racing, actively participating in our race preparation,” Dallenbach said.